In Recipe #27 I am going to show you how to replicate the Library layout I made for my Ventura Child Theme using the filterable portfolio module. 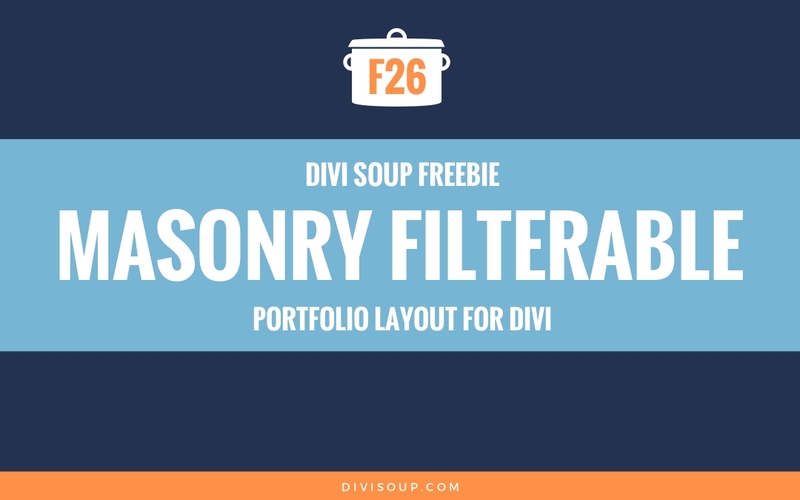 One thing I hear lots of people complaining about with Divi is that as far as the default builder goes, it’s limited to 4 columns, in this recipe I will show you how to have as many columns as you like AND how to change the default image size so you can truly have the layout you want. As the filterable portfolio relies on projects and is actually very simple to set up, I haven’t included a .json layout with this recipe, but what I have included is something a little better (at least in my opinion). A handy Excel Spreadsheet calculator to help you adjust the CSS for both the columns and the filter buttons so no matter the amount of content, your portfolio is going to look great. 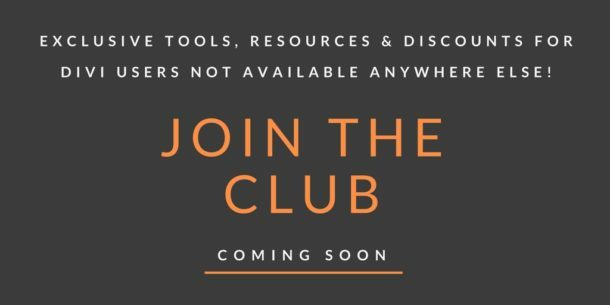 Watch the video, get the code you need in the accompanying blog post and be sure to let me know what you think in the comments! First let’s set up our portfolio module. On your page, add a new standard section with a single column and add a filterable portfolio module..
Next, open up the row settings and set fullwidth to yes. Then save & exit. You don’t have to do this but if you are going to use more than 4 columns you’ll probably want to utilise the extra space fullwidth gives you. 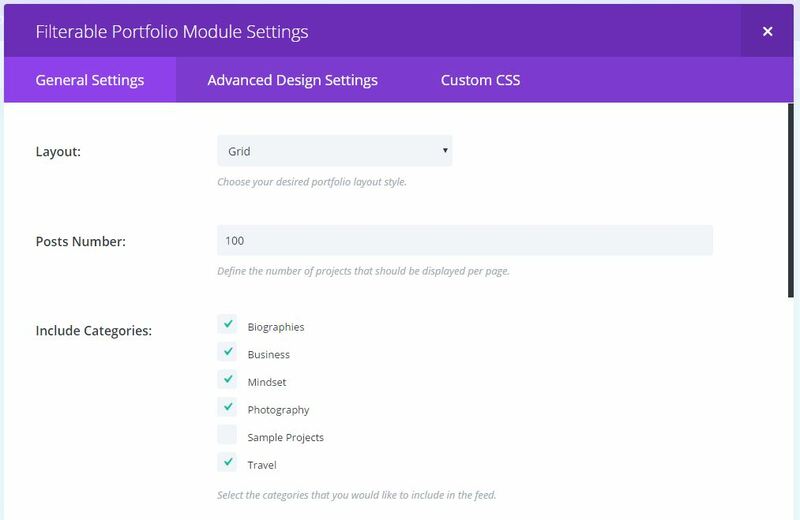 Now open up the filterable portfolio module and in the general settings set the layout to grid, the posts number to whatever you want, and include the categories you want to use. The categories are what create your filter buttons, plus you get a button for all categories. Switch off show title and show categories, pagination is up to you. The first part is where we define our columns and margin for the portfolio, we are setting the column width and margins using percentages so we always get a nice even layout. Next we are defining the columns and margin for the filter buttons, then making sure that the last button in the row doesn’t have any margin on the right. We don’t need to do that with the columns as Divi does it for us already. Here are our media queries for the filter buttons, we are just adjusting how many buttons are in each row on smaller screens. I wouldn’t suggest changing anything here or your buttons may end up being too small but that’s up to you. We don’t need any media queries for the columns, Divi does a pretty good job of dealing with that for us. And finally this last little snippet just ensures that our images show on tablets and mobile. Here is all of the CSS with full comments. Copy and paste this into your child theme stylesheet, Divi options custom CSS box or the page specific CSS box and be sure to save. So now you should have a nice 5 column filterable portfolio (we will get to your filter buttons in just a bit). But what about the images? Depending on the dimensions you have used, you may be getting some cropping, let’s fix that! Add the following code to function.php in your child theme and be sure to save. 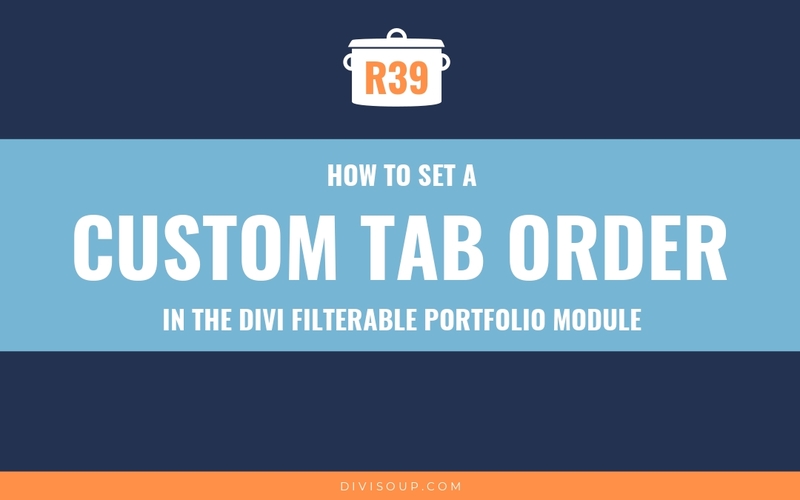 What we are doing here is changing the default height and width values Divi uses for the portfolio images to ‘auto’, this will ensure your images display in the aspect ratio you have saved them at, but will scale them to fit your column layout. Now take a look at your page, cool huh? Now for the fun part I have created an Excel Spreadsheet calculator for you to use to customise your columns and filter buttons. If you don’t have 5 categories as I have used in my demo, then you won’t have 6 buttons so you’ll have some extra space to the right of your filters. The calculator will help you fix that. The first row of numbers is for your columns and the second is for your filter buttons. The green fields are where you add your value. 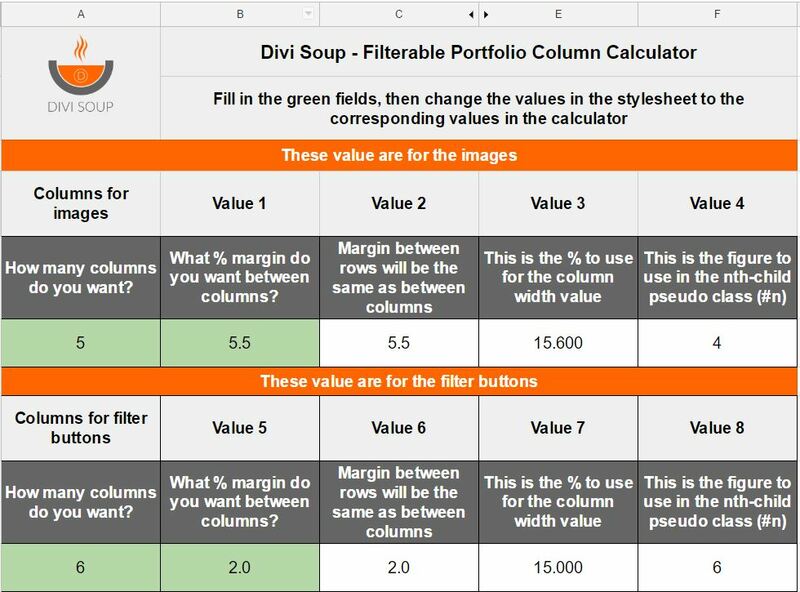 In the first green field of the first row of numbers, enter how many columns you want for your filterable portfolio, in the second green field, enter the margin you want between your columns. Fields 3, 4 & 5 in that row will automatically adjust based on your settings. In the first green field of the second row of number, enter how many columns you want for your filter buttons. This number should be your total number of categories, plus 1. So if you have 5 categories, enter the number 6 as we automatically get an extra button for ‘all categories’. In the second green field, enter the margin you want between your buttons. Fields 3, 4 & 5 in that row will automatically adjust based on your settings. For both the columns and the filters, the third field is the margin between rows, which I have set to default to the same as the margin you set in the second green fields, this means your spacing between your columns and rows will always be even (I can be a bit obsessive about spacing ). Now lets apply your settings to the CSS. In the section of CSS below you will see comments beside 3 values you need to change. These are your column settings, the first row of numbers in the calculator. The first is the nth-child value, change the 4 in (4n) to the number shown in the Value 4 field in the calculator. Then change the 15.6 width value to the number shown in the Value 3 field. Finally change the two 5.5 margin values to the numbers shown in the Value 1 & 2 fields (these will be the same). Now for the filters, this is the second row of numbers in the calculator. Change the two 2 margin values to the numbers shown in the Value 5 & 6 fields in the calculator (these will be the same). Then change the 15 width value to the number shown in the Value 7 field. Finally, change the 6 in (6n) to the number shown in the Value 8 field in the calculator. Copy all your new CSS and paste back in to wherever you are saving it (child theme stylesheet, page specific CSS or theme options CSS) and save. That’s it, all done! Now if you add or remove a category just use the calculator to work out your new values and change them as shown above. Its difficult to say without seeing the full functions.php file and knowing your setup, its works fine for us. This is a wonderful tutorial. I was using this on a dev site and it was working fine. I wanted to use 6 columns and it worked great. However, I then installed an updated version of Divi and now no matter what I try the most it will display is 4 columns. The site is working responsibly on iPad and iPhone but will only go to 4 cols on the desktop. I was wondering if you had seen this before and if you had any suggestions on what I might be doing wrong? Thank you! Thank you for this recipe. Do you know if it still valid with new divi versions? I’m trying to achive this but no matter what I’m always getting 4 columns alligned to the left with lot of empty space on the right. 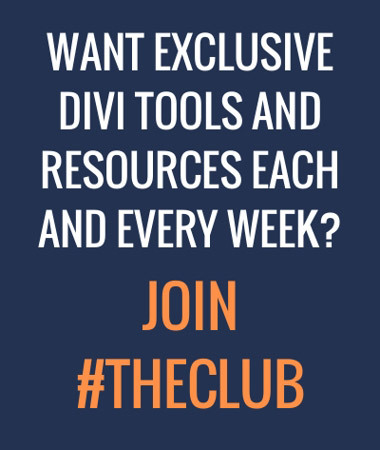 Many Divi changes since this was created. Check out our CSS Grid recipes which provide a much better way of responsive column management. There have been many updates which affect this. Check out out CSS Grid recipes, which will make adjust columns much easier. We have been using this tutorial for our website and has been working perfectly. However, when I updated the divi theme, the filterable portfolio now displays 4 columns instead of 6 columns. Do you have a patch to fix this problem? Yes many updates have broken this. Please check out CSS Grid recipes for a much better way to manage this. This is amazing. I found this tutorial months ago and it has worked perfectly. Now, all of a sudden the columns now only display 1 less column then I specify. The only problem I am having is that my images don’t appear on mobile. I have the width for mobile set at 100%, but I can’t get them to show. Do you know what it could be? Thank you very much, it was really useful! I used this recipe before and it worked perfectly. Now I tried everything, but it’s not working. Could you maybe help me? Thanks for your response, but I already fixed it! I didn’t work, because I changed the column settings. Now I changed it back and it’s working again. I did this and it looks great except when the screen is large than 960px wide, it gets off center, with there being a gap of space on the right side of the portfolio. I tried doing CSS to make align-items center or change the margins, but I must be using the wrong element. Do you know what to do? Thanks! Hi Michelle, I have a problem, i tried to make portfolio according to your instructions but now i see it is no more responsive. What could cause that? Likely cause is an error in your CSS, as you can see from my demo, it is responsive. You can add text using pseudo elements or displaying the title and category in the module settings and then positioning them with CSS and setting them to display on hover. first great blog you helped me so often! Thank you so much. I want to remove the margin between the portfolio images on mobile screens. I tried so much, but didn’t get any results. I used your recipe and it works perfectly! However, how do I get the images to move into the empty spaces? I have 3 rows of projects displayed, and the rows below the first one are limited in height to the tallest images above it. How do I get the images below to move up into the empty spaces above? 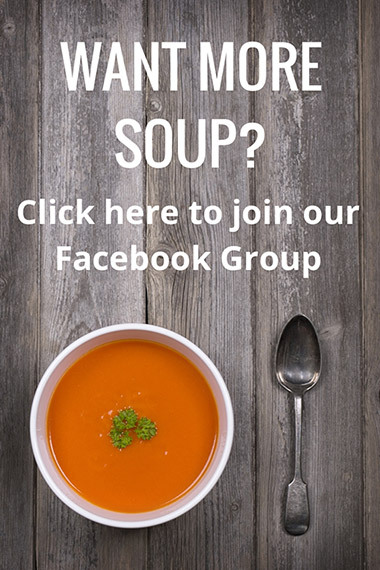 When trying to use this recipe, I find that the images used for the grid are a smaller version of the thumbnail than that which is used by default (300x200px, vs 400x284px – these are people’s portraits). The result is a blurred image in most display sizes, because it will be stretched to fill the space allotted. I am only using the part of the css which pertains to the image itself (not using the filterable grid), plus the php modification. I have rebuilt thumbnails, twice. Any pointers would be highly appreciated. 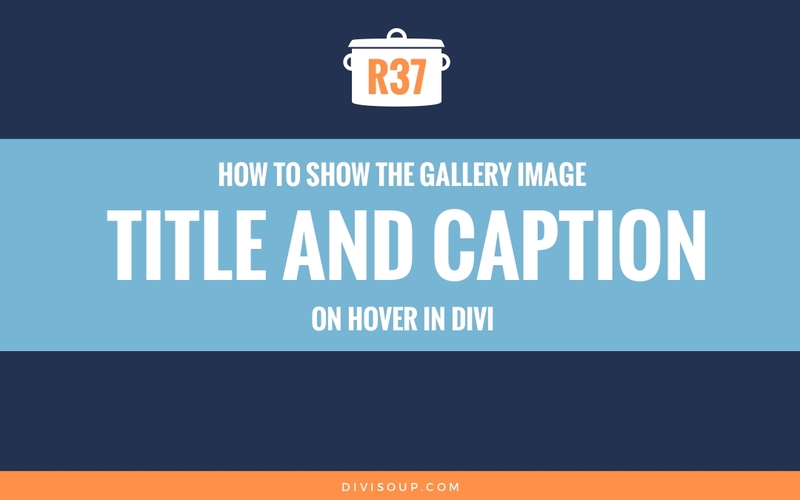 These thumbnail sizes are set by Divi within the php files so your best option would be to contact ET support as to where to change those. I’m having an issue with my thumbnail images being blurry and when I inspected the element it looks like they’re automatically being resized to 150x150px and then being stretched to fit the square box. My images are at least 500x500px so there shouldn’t be any reason for them to be blurry. It seems like this is something built into the Divi theme, do you know how to fix this? Amazing! Truly amazing Thank you so much. I love the included calculator..super helpful. Question….I would like to have 3 columns but maintain a certain image size. When I do 3 columns the project image gets very large. I would like to keep an image size to 80px X 80px. Is this possible? I’m sure it must be very similar code, I’d like to do this on the standard portfolio rather than filterable, so I can have 6 columns rather than the default of 4 columns. 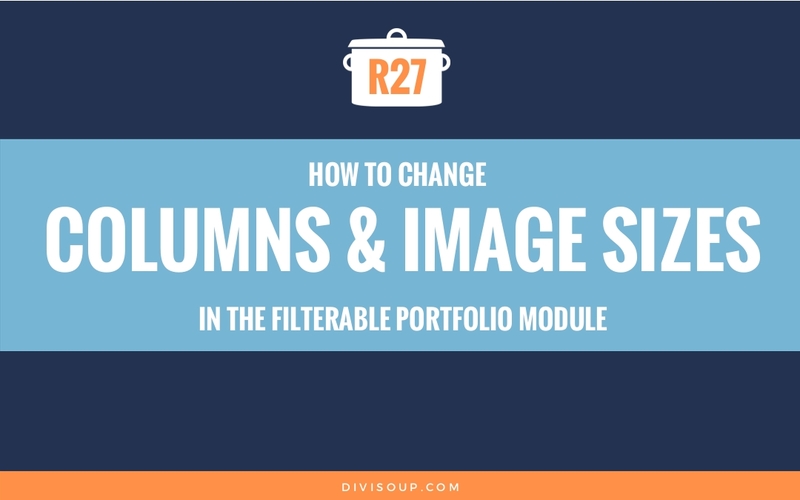 do you have an example of this to show it works, since when I tried your suggestion I couldn’t get the columns changing on a standard portfolio grid? This was so helpful! Thank you for sharing. When I do the php to change the image size to the thumbnail, the image looks blurry. Any advice on how to adjust the image settings to prevent the blur? It looks amazing! Thank you so much. I have a question in relation to the PHP, as it is not just the pictures in the filterable portfolio that is affected by the code. Right now the ‘fullwidth portfolio’ is compressed because of the PHP I added. How can I make sure that my ‘fullwidth portfolio’ images will not be affected by the PHP I added to change the filterable portfolio? Hi Michelle, thanks a lot for your great tutorials. I use them a lot. I have one question. Is it possible to remove the “All” tab? And the content? I would like to show only the projects when clicked on, and not all of the projects at once. Or maybe show no categories when one click on “All’. I hope you understand my bad English. Hi Michelle, I managed to remove the “All” tab, but not the content. Great tutorial. Is there a way to allow the featured images to be their own width rather than full width? I am using this for a business directory and the logos are stretching. Can you guide how to use a custom field (project or post) in portfolio? Thank you so much! Thanks a lot, great job! I have a problem, I’m using two columns, and when the number of items in a category is even, the last project is showing with no margin, do you know why? 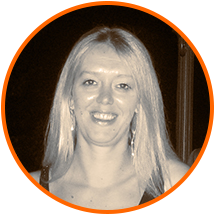 Thanks Michelle, find your site is solving many problems! I wanted to know how you can sort the filters and the contents of the portfolio in alphabetical or other order. Thanks for this tutorial, it was a huge help for my site build. Do you know if there is a way to make the default category something other than “ALL” when landing on the page? Thanks again. Perfect timing, thank you Michelle! Just need access to that file…? I’ve been looking at updating my portfolio page for my website and I came across this recipe. Is it possible to center align the buttons in the section? Can I have the project thumbnails that appear below the buttons also appear centered? For example I want three portfolio ‘thumbnails’ displayed per row and if the number of projects I’m displaying is 10 then on the last line the ‘single’ portfolio image would be centered. Hope that makes sense, I also tried to download the Calculator but it looks like I need access to the file. You can add margin: auto; to the .et_pb_portfolio_filters ul and .et_pb_portfolio_items classes to center align the buttons and images. Margin auto will only work if you have a width explicitly set. Thanks Michelle – I will try and work out how this works. I’m still not able to access the Spreadsheet, for some reason Google won’t send the request through. Where do i explicitly set the width to what element to be able to center align the filter buttons? Is there a way to recolor the border color of the buttons? I am also hoping to add title hovers to the images. Is this possible?